Niaouli and Lavender combine their natural healing powers to leave you physically, mentally and emotionally renewed and refreshed. Breathe in this soothing scent to wonderfully restore confidence and self-belief. Lovely scent. No smoke came off it which is great. It didn't give off any fumes so I felt better about burning it with my kids in the room. Lovely packaging. A combination of longevity of burning and enticing scent make this the perfect candle! This candle is just lovely; between the scent, the clean-burning soy wax, and the beautifully designed jar, it's simply gorgeous. As a new years resolution I decided that I would try to change my outlook on beauty products. I wanted to become more conscious about what I put on my skin. Through the year so far I have become really serious about the products that I use because I know that there are so many harmful ones on the market. 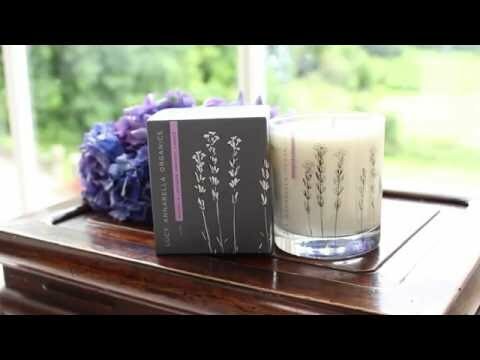 I have a weak spot for candles and saw the Lucy Annabella Organics Niaouli and Lavender Aromatic Candle – I read the ingredients and knew I would like it and to say the least I was blown away. Not only is this a gorgeous candle but I then found out I could buy a matching bath milk…….sold! My bathroom is now a spa. I light my Niaouli & Lavender candle and pour a capful of Muscle Quence Organic Bath Milk and go to heaven for an hour. Cannot wait to try more candles and bath milks – my new guilty pleasure. Gorgeous scent - and it lasts for ages!